Gwent is a card collecting strategy title where players challenge each other in one on one bouts, for fun, rank and rewards. Originally designed as an optional side-feature in the solo roleplaying game The Witcher 3: Wild Hunt, the tavern card game that players could play within the RPG against various NPCs was extremely popular with fans and so spawned its own Card Collecting Game (CCG). 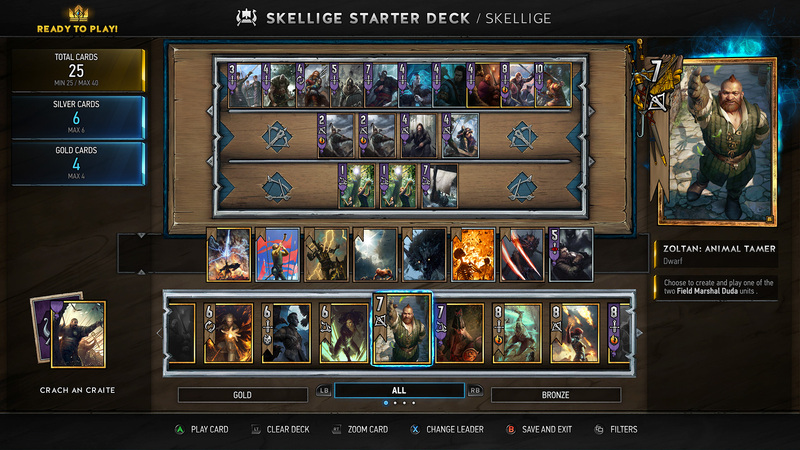 This free to play game has many features of other traditional CCGs but has a number of original elements that stand it out from others, combined with being steeped in the lore of The Witcher series. Players will battle in ranked or unranked matches, win rewards, earn new cards and be able to construct their decks from a wide variety of cards divided up into five unique factions that provide a different playstyle and cards that are unique to them. To start the gameboard of Gwent is divided into a battlefield of two halves, where each player will place their own cards; in their half of the battlefield they have a row for melee units, one for ranged and one for siege weapons. In the first round players each drawn 10 random cards from their deck into their hand and take it in turns to place cards onto the battlefield; each card has an attack value that determines its strength and the goal for a round is to try and finish with an army that has the highest combined attack value of all their played cards. The goal is to win two out of the three rounds, when cards are placed many will have different abilities that give their army bonuses, attack multipliers or hinder the enemy in various ways. Players do not draw any extra cards during a round, and they do not have to spend resources to play a card, instead they act and react in turn to place cards until they do not want to place any more, at which point the player with the highest attack score wins the round. Going into round two players only have the cards remaining in their hand, plus an extra two cards drawn from the deck, instead of starting with a full hand of 10 cards again. Similarly when they head into the third round they only draw one new card. The strategy comes in choosing where and when to place your cards, which rounds to win or forfeit, trying to get your opponent to spend powerful cards leaving them weaker in later rounds. Looking for more Free MMO turn-based,Free MMOs games?